i cant find a logarithmic potentiometer. can i use linear instead? leftfingaz wrote: i cant find a logarithmic potentiometer. can i use linear instead? thanks.. how about rev log? Like others said, you can get the full range with either taper since the value is the same, but for some applications it could be very difficult to use a linear instead of a log. The full range of the control is bunched up on one end, so you have 90% of the rotation that doesn't do much and then 10% that goes so fast you can't fine-tune it. Using linear is OK for breadboarding and testing, but if you're building something to keep (or to give away) then try as hard as you can to get the correct taper. 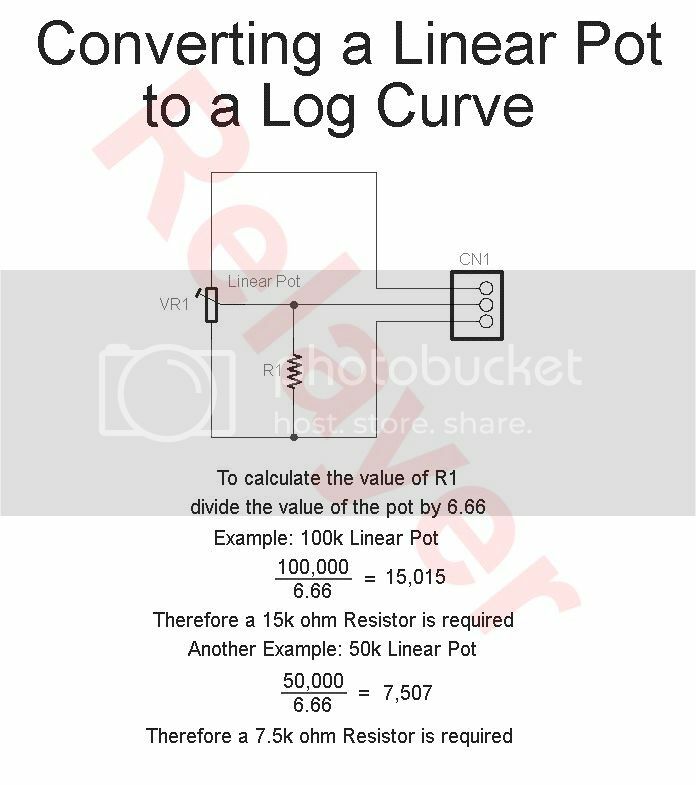 The link already provided (http://www.geofex.com/article_folders/p ... tscret.htm) not only explains about pots, but shows you how you can get a linear pot to give a logarithmic type of response by adding a resistor or two. Here's a circuit that will provide some approximation of a Log curve using a Linear Pot. I needed to come up with this as I needed to use Linear dual pots whereby one of the pots required a Log curve. The circuit idea is not mine, I found an article in a popular Australian magazine called, Silicon Chip on this conversion. Relayer110 wrote: Here's a circuit that will provide some approximation of a Log curve using a Linear Pot. i will connect a resistor to lung 1 and lung 2? how about rev. log? Rev log is the exact opposite of log. In a logarithmic pot the resistance is more spread out on the first parts of the pots rotation, which is useful for for instance volume controls. In a lot of LFO designs on for instance phasers, the speed knob requires a more spread out resistance at the other side of the pots rotation, so the changes in speed are spread out more evenly across the pot's rotation. If you use a logarithmic here and wire it backwards it will have the same response, only that when you turn the knob clockwise it will slow down instead of speeding up, which feels counter-intuitive. Liquitone wrote: Rev log is the exact opposite of log. In a logarithmic pot the resistance is more spread out on the first parts of the pots rotation, which is useful for for instance volume controls. thank for all your answer..